Durable plastic nib provides skip-free writing, great for every day multipurpose use. A fine or medium width (0.4mm to 0.5mm) can be achieved, based upon your personal writing preference. 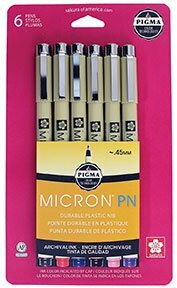 Pigma Micron PN 6-color set Black, Red, Purple, Rose, Sepia and Blue/Black. Waterproof, fade-proof, smudge-proof and no feathering.